César Bartolomé (Valladolid, Spain, 1972) started his music studies at the Conservatory of Music in Valladolid and degreed from the Conservatory of Music in Salamanca. Since the very beginning of his career, he showed a special interest for music composition and teaching. To this latter, he has been devoting these last fifteen years and in several music centers. Since 2007 he has been teaching at the Conservatory of Music in Tenerife. In one of his classes here, namely Music and Audiovisual Media, students complete a short film in which the entire production, including music, is achieved and performed by students. Besides teaching, Bartolomé also composes music with commercial purposes. For instance, he is the author of the music used by La Calesa, a publishing house who produces interactive media for primary education. 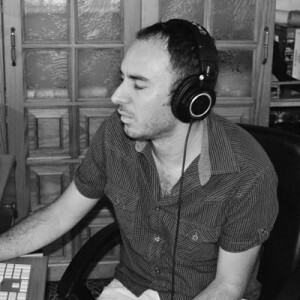 He has also composed the music for the promotional ads of Arrecife, the very touristic Lanzarote’s capital. The spots could be seen, among others, at the International Fair of Tourism – FITUR. He is also the author of pieces for chamber music groups, that have been performed and occasionally recorded. Finally, Bartolomé produces and conducts arrangements for orchestras, music bands and film. As such, he collaborated with Ángel Borrego Cubero, the filmmaker of The Competition, the awarded architecture documentary and Official Selection film at well established festivals such as the Intl. Festival of Film on Art – FIFA’15 in Montréal, the Vancouver Inlt. Film Festival – VIFF’15, the Intl Festival of Film on Art from Naples – Artecinema’15 or the Intl Documentary Film Festival – DocumentaMadrid’14.